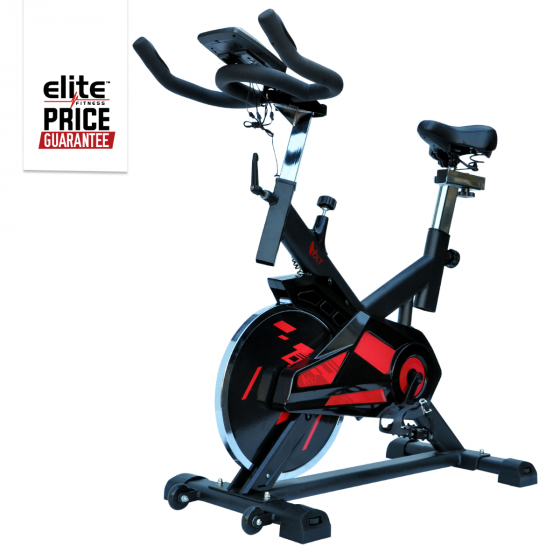 The Volt Spin Bike by Elite will quickly become your favourite home cardio machine. The Volt is manufactured with a 35-46 degree angle golden triangle construction to provide a comfortable position for the rider. To further enhance the ergonomic features, the Volt Spin Bike includes limitless seat adjustment, anti-slip toe cage pedals and horizontal handlebars. Receive valuable workout readouts on the console display located in-between the heart rate sensor handlebars. The near silent Volt Spin Bike reduces vibration through the built-in shock absorption system, allowing you to train hard without any noisy distractions. The Volt Spin Bike is suitable for a range of fitness levels. Push your endurance and get cycling today. Height adjustable multi-position handle bar. Console/ Display Readouts: Scan, Time, Speed, Distance, Calorie, ODO, Pulse. Adjustable padded seat: both vertical and horizontal adjusting. Pad breaking system with infinitely adjustable breaking power.